Drag and drop home page elements to create your own perfect home page layout! 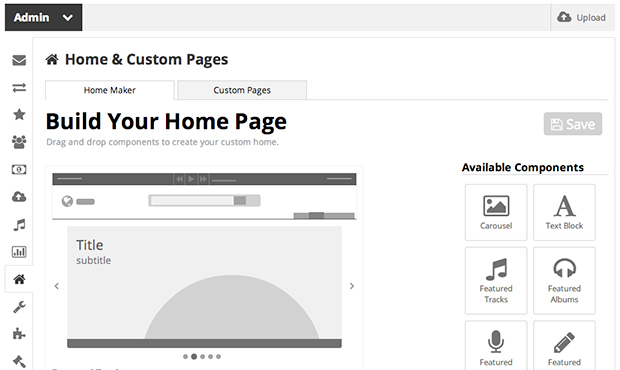 To access the new "Home Page Maker" tool, simply visit your Admin Panel and navigate to the "Home & Custom Pages" section on the left. When you land in the new Home Page Maker you'll see an interactive module layout image representing what your home page looks like today. If you don't use a home page today this area will be blank, but you can easily add and edit modules by using any of these actions below. To add a new module to your home page just grab the module type icon to the right and drag it into your home page layout on the left. Drag it around to position it as you like and let it go when it's in its desired location. To remove a module from your home page just grab it in your home page layout and drag it back out over to the right into the module selection area. To edit the content within a module just mouse over the module in your home page layout, click the little settings icon in the upper-right, and an overlay will appear. Make your changes and additions within the overlay and save them when you're finished. To publish the updates on your updated home page just click the big "Save" icon in the upper right of the Home Page Maker tool and you're set! That's it! We try to keep things as simple as possible in regards to usability so we encourage you to give this new tool a shot. Dig in, customize your layout, feature your music, add reels/videos/images as needed, and set up your home page in the way you feel best represents your music, business and brand. Have fun with this new tool and you'll hear from us again soon!